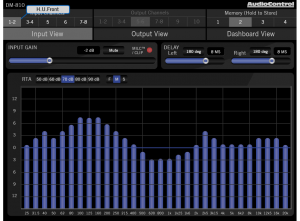 When you require total control and optimization to achieve great sound quality, AudioControl’s DM-810 Processor is the solution. 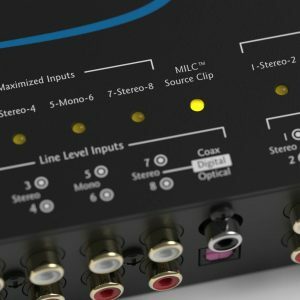 The powerful AudioControl DM-810 processor allows users to truly optimize the performance of their audio system, regardless of whether they are using a factory or aftermarket source, and to truly achieve the goal of “Making Good Sound Great”. These highly versatile Digital Signal processors are equipped with key features, such as active speaker level inputs, line-level and digital audio inputs, providing up to 10 channels of output. 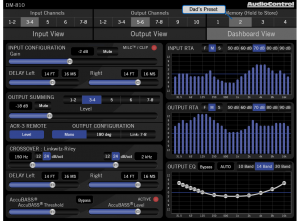 AudioControl’s “smart user” interface contains the power of AudioControl processing through a flexible PC interface packed full of features in a simple layout. Configure signal summing, 30 bands of equalization, signal time-alignment, input delay and phase correction, plus AudioControl proprietary features like AccuBASS®, GTO Signal Sense, and MILC as well as integrated input and output RTA’s. 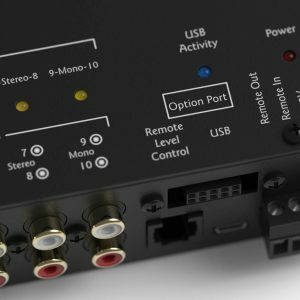 The built in Option Port on the DM-810 is the future of car audio and will allow hi-res streaming directly into the DSP. It also opens up future proprietary connections for additional inputs, controllers and interface solutions. Designed to be the ultimate in sound quality and enhanced audio performance, the AudioControl DM-810 is AudioControl’s latest processor that sets a new standard for sound and what can be achieved in car audio systems. The DM-810 features AudioControls MILC (Maximum Input Level Control) patent-pending source clip detection circuit. 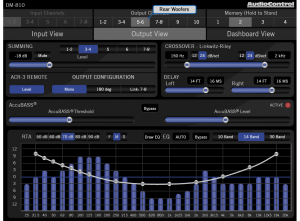 MILC calculates when the waveform of an incoming audio signal is clipping, and if it is, the LED will fulfill its prime objective and shine forth, aiding in precise level matching control. Watch this space for future Option Port expansion options. 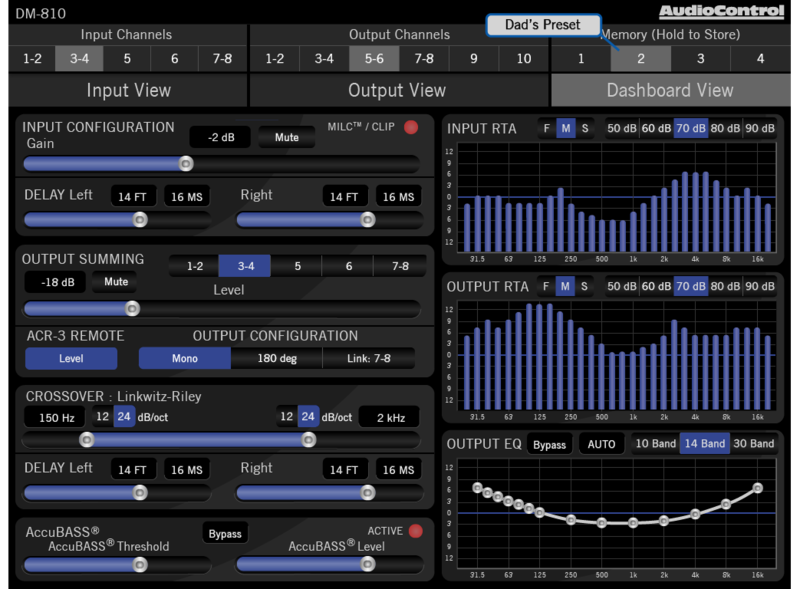 Connect your laptop to the AudioControl DM-810 using AudioControl’s Smart User Interface, a fully featured Matrix DSP Interface designed to give you instant and clear control over every aspect of your processor. 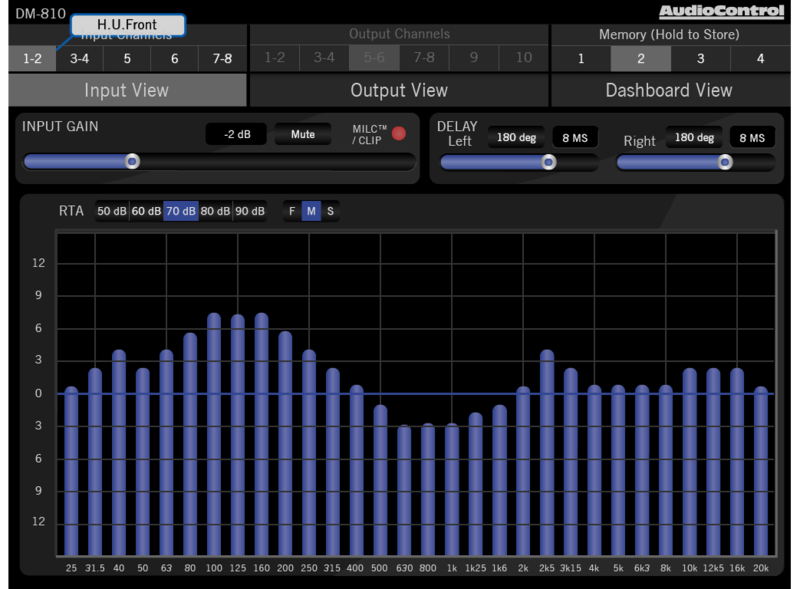 Route any input to any output, adjust gain, delay and polarity then precisely tune the AudioControl DM-810 using a 30 band EQ. High-pass, low-pass and band-pass can be set up for any output using 12 or 24 dB/octave Linkwitz-Riley crossovers. For OEM integration, take advantage of the input and output RTAs, available for every input and output, to easily identify and sum factory speaker signals. 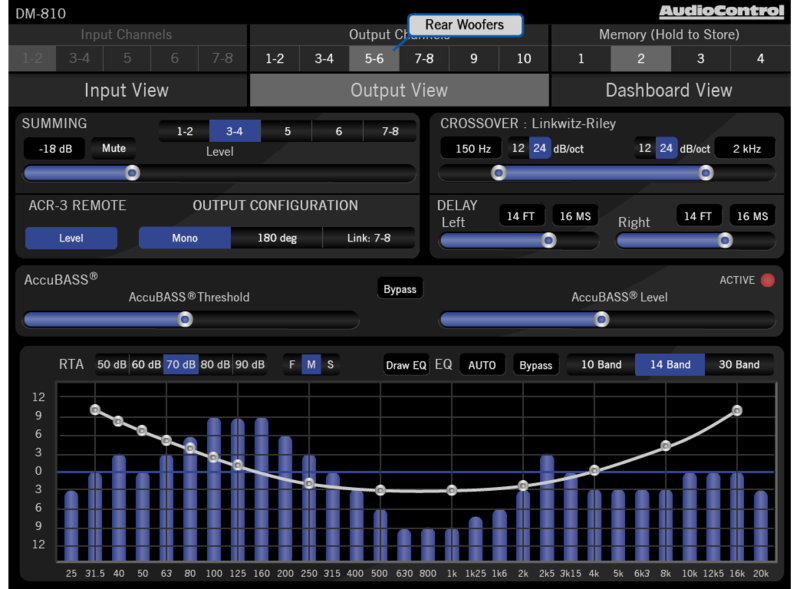 With a clear GUI and intuitive workflow, AudioControl’s Smart User Interface will take the guesswork out of tuning your system to your exact specifications. Sound In Motion your local Authorised AudioControl Stockists and Installation Centers on the Sunshine Coast.